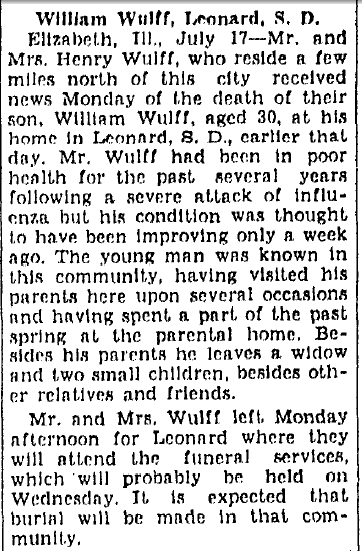 Below is the obituary for William Wulff, son of Henry Jr and Mary (Bohnhoff) Wulff from the Freeport Journal-Standard, 17 Jul 1934. Elizabeth, Ill., July 17 – Mr. and Mrs. Henry Wulff, who reside a few miles north of this city received news Monday of the death of their son, William Wulff, aged 30, at his home in Leonard, S.D., earlier that day. Mr. Wulff had been in poor health for the past several years following a severe attack of influenza but his condition was thought to have been improving only a week ago. The young man was known in this community, having visited his parents here upon several occasions and having spent a part of the past spring at the parental home. Besides his parents he leaves a widow and two small children, besides other relatives and friends. Mr. and Mrs. Wulff left Monday afternoon where they will attend the funeral services, which will probably be held on Wednesday. It is expected that burial will be made in that community.